Ideálny reprobox pre gitarovú hlavu Peavey Butcher 100W osadený špeciálnými reproduktormi Stephens Tru-Sonic 30 s výkonom 120W / 16 Ohm. 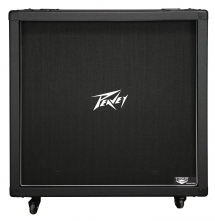 Featuring premium Stephens Tru-Sonic 30 watt speakers, the all new Peavey 430A cabinet brings back the classic sound of the guitar 4x12 cabinets of the 1960's and 70's for Peavey Butcher guitar head. USA made and ready for the road! Four 12" (305mm) Stephens™ Tru-Sonic 30 watt speakers.